A sacred tradition for Minnesotans each summer is going up to the lake for the weekend, especially those landlocked in the concrete jungle of the Twin Cities. Considering Minnesota is the land of 10,000 lakes, just about everyone has special memories of spending a summer weekend on the water. One of the most common arteries up to this gateway to paradise is U.S. Highway 10. And just past St. Cloud on your way northbound, is the legendary tourist trap Treasure City. The tiny little highway town of Royalton might as well just change its name to Treasure City, since it’s clearly the biggest draw. For many, it’s the halfway point on the journey to solitude. This place is packed to the gills with bric-a-brac, knick-knacks, and other assorted junk. The motto is “something for everyone,” which is pretty damn accurate. 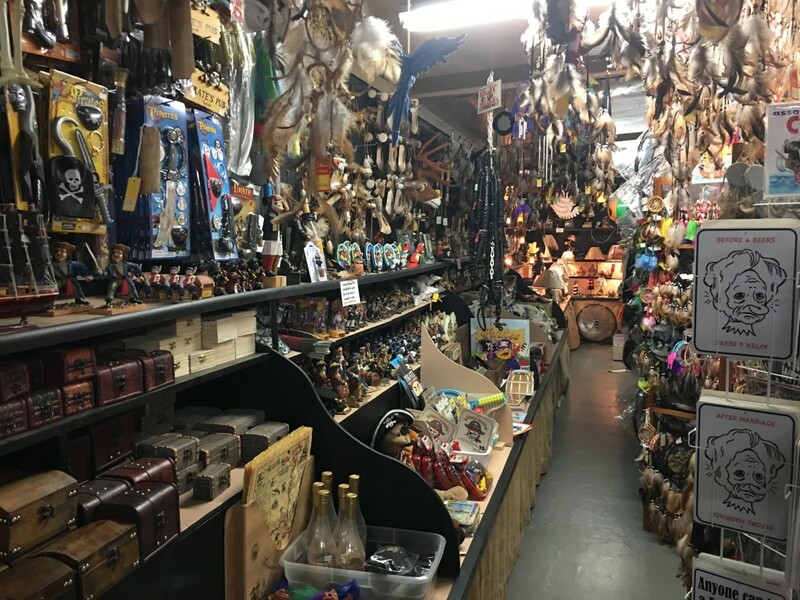 There is authentic Minnesota trinkets, knives with dragons on them, seashells, alligator heads, t-shirts, candy, lawn ornaments, windchimes, and everything else you can think of. There is absolutely no space in this place unoccupied. No rhyme or reason, either. Treasure City has been around since the 60’s and draws in thousands of tourists each summer, probably more. The owner, Bob Janski, will probably be there when you stop. 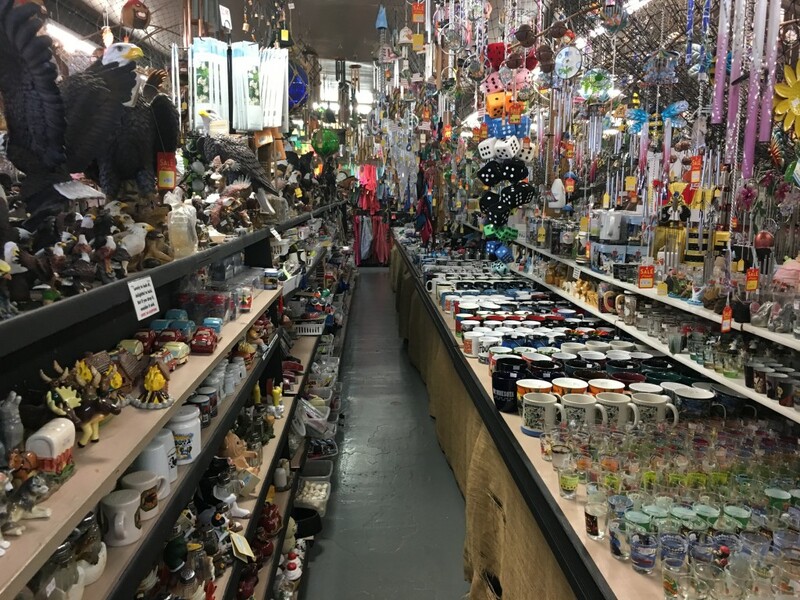 They have the all the standards like shotglasses and coffee mugs and mini license plates with your first name on it, to polished rocks and cap guns and more. Pose outside in a pirate ship scene or let the dog run around in the grassy lot behind the building. It’s no surprise that there have been countless news stories and articles about this place. A few years ago, KSTP-TV, (the ABC news affiliate in the Twin Cities) featured Treasure City in their weekly Sunday night installment of ‘On the Road with Jason Davis.’ This segment features a British-accented reporter exploring unique regional areas and reporting back on his findings. My cousin Rob and I had the fortunate luck to be present when they were filming and even made it onto the final cut. You can watch the video here; look for us at about the 00:54 mark and again at 2:15. I recall we were looking at corncob pipes at the time. The place is definitely worth the stop. For most, once is usually enough. Kids will obviously love it, and the “kid in you” probably will too. 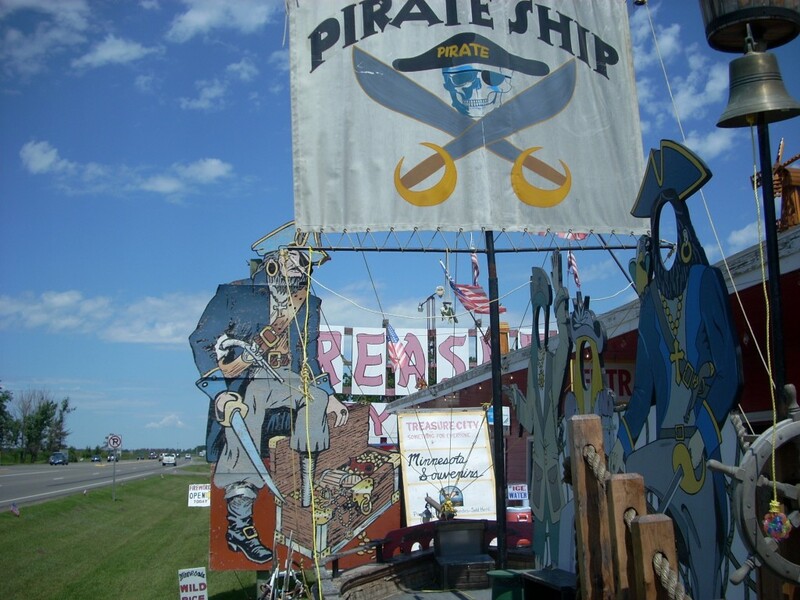 It’s the Wall Drug of Minnesota, and a great stop on your way through the state. While in the area: The Blanchard Dam on the Mississippi River is just north of town on the Lake Wobegon biking trail, and the Lindbergh State Park is just north of Royalton in Little Falls, MN. Little Falls is also home to the Minnesota Fishing Museum. 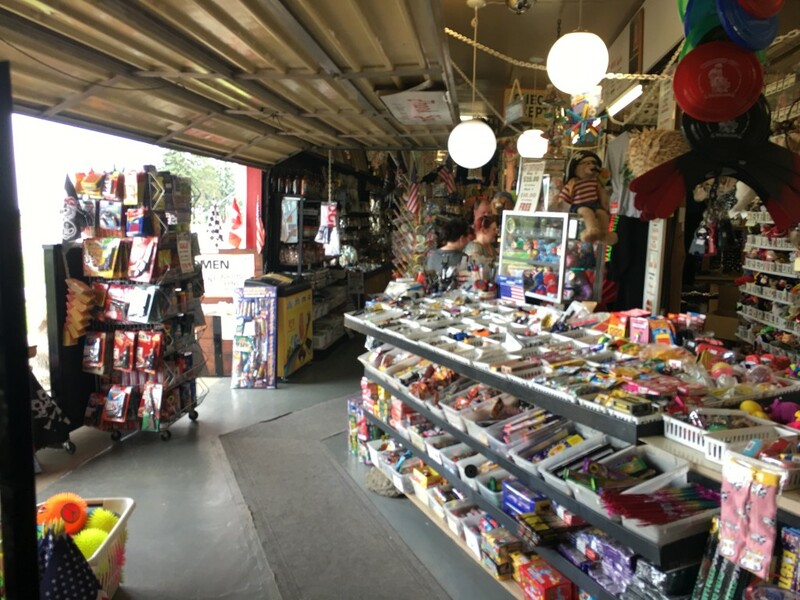 This entry was posted in Highway Highlights and tagged MN, Roadside Attraction, Royalton, Tourist Trap by Seth5544. Bookmark the permalink. I was wondering if you have lawn ornaments ?